Congratulations to Plymouth Junior Anna Brandl and Canton Junior Megan Swan. 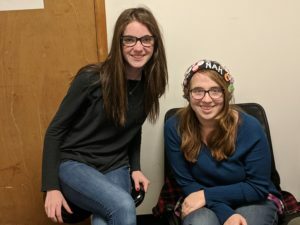 They were selected as 88.1 the Park’s March 2019 Staff Members of the Month. Anna is the Promotions Director for 88.1 the Park. She was recognized for her excellent on air work as a DJ, her organizational work as Promotions Director and for coming in during Spring Break to clean and organize the station. She will be 88.1 the Park’s Operations Director for the 2019-2020 school year. Megan has shown incredible improvement in her news writing and on air work. Her willingness to put in the time and hard work necessary to grow is commendable. She has also been working behind the scene in our production studio to create imaging sweepers. “We are so lucky to have Megan and Anna on our staff. They both set a great example for what it means to be a dedicated staff member. They make 88.1 the Park great for our staff and listeners,” said Bill Keith, Station Manager.